З Різдвом Христовим всіх вас ! Спасибі за наступні мій блог. Okay that’s about it for the Ukrainian writing! As you are aware, I am still learning about the cyrillic alphabet and basic Ukrainian language at the Taras Shevchenko Ukrainian School. It has been a great year and in my humble opinion, we are learning a lot, as well as building up many personal friendships as we struggle with developing a better understanding of vocabulary and conjugating verbs, and, oh, I could go on and on. To say the least, it’s mind-boggling but it is so much fun! 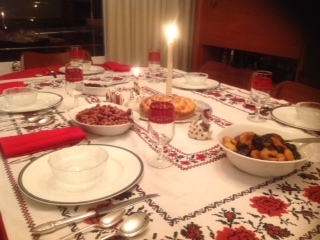 Tonight is Christmas Eve for many Ukrainians. All day yesterday and part of today, I have been busy preparing for the Christmas Eve supper (Svyata Vecherya). This supper is part of the celebrations. But I had a wonderful day because of a very different reason. It may sound silly but I was able to tune in Ukrainian Christmas carols from the Dauphin radio station. All day long, these carols filled my kitchen. I hummed and sang along while chopping onions, grinding poppy seeds and stirring the borscht. It was very relaxing and brought a flood of memories back to me about growing up in the prairies. It would be great to be there now with my family and friends. However, I think that the memories will be fine right now. You see, it’s 8C here tonight and it is -21C in Manitoba. So I’ll think warm thoughts for everyone back there and pray that you all have a wonderful Christmas Eve, and that the temperatures rise as well. ← Happy New Year 2015 ! I am also listening to CKDM, and enjoying the program very much.. We usually spend this time in Dauphin and enjoy this special time there but this year sadly we are unable to travel there!